The Quartet Prestige Dry Erase One Month Calendar is another great whiteboard with a slightly larger than normal size – it measures in at 36 inches by 24 inches. This convenient size allows for ease of use while keeping it to a manageable size that you can easily put into an area in an existing office, home, or classroom. With the one month planner already set out on the surface of the Quartet Prestige Dry Erase Calendar you get enough space in order to write plans, to-do lists, and appointments for each individual day. Some smaller calendars are a bit cramped and you end up having to write very small, erase frequently, or you just run out of room. This Quartet Prestige large calendar whiteboard has a superior surface – something that is very important to consider when purchasing a white board. The better the quality of the board, the easier it is to clean off and the less chance you have to end up with “ghosting” or marks that don’t fully erase. Of course, proper care and maintenance, along with quality cleaning products, will help keep your whiteboard fully functional and looking good for years. 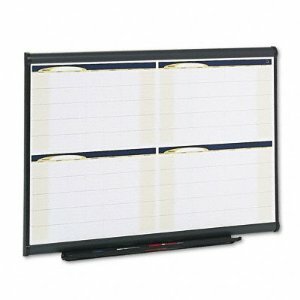 This whiteboard comes with its own mounting and hanging system which allows you to easily and securely put your whiteboard calendar where you want it from day one. Along with the whiteboard comes the standard marker and eraser tray that is factory installed – no snapping in or assembly required. As shown in the picture, the tray mounts on the middle of the bottom portion of the board and covers a large segment of the bottom area – a nice feature to have as a tray that is too small can become a headache when you have several whiteboard markers and an eraser. 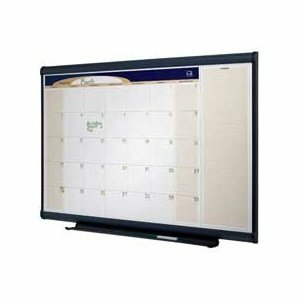 Overall, the Quartet Prestige One Month Dry Erase Calendar is a great whiteboard calendar that has a good surface that will withstand a long period of use. 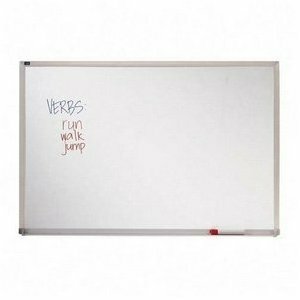 The large area ensures ample rooms to write and the board features a nice graphite frame that will look good in any setting. 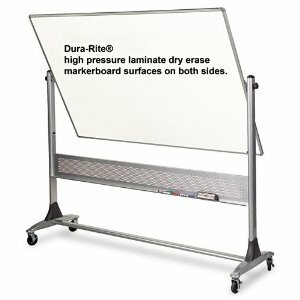 Interested in more Quartet whiteboard products? Check them out at Amazon.com.